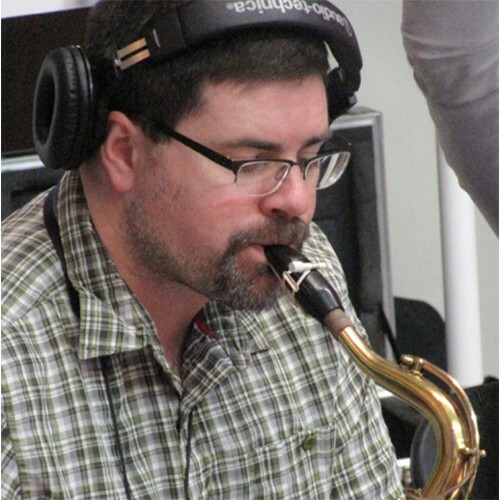 Dave got his start in the early 90s playing lead alto sax in several jazz and classical ensembles throughout the Pittsburgh area, where he studied with renowned saxophone and flute master, Eric Defade. He went on to double major in Physics and Music at Wittenberg University in Springfield, Ohio, where he studied sax, flute and clarinet with local woodwind legend Harold “Hap” Ashenfelter. He was the lead alto player for the Witt Jazz Ensemble, and twice selected for the Ohio Private College Instrumental Conductors Association Honors Jazz Band. Dave fills out the Saxophone Section on tenor sax, clarinet and flute.